At the beginning of the season, I would not of thought I was the only one who was asking the question, who is Jamie Collins, but after nearly a whole season, there are now plenty taking notice of the twenty eight year old from Geelong, who will compete in his first National Super Sedan Title at the Heartland Raceway, Moama, next Friday and Saturday nights. 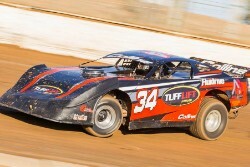 Driving one of sixteen Sweet Chassis in the field of forty six, Collins has plenty of credentials, having won six State Titles in AMCAs and twice has been the runner-up in Australian Titles. This will be Collins first National Title in Super Sedans, one he is very much looking forward to. I have raced twice in the Super Sedan at Moama, we finished fifth in the Victorian Title this season after starting thirteenth, it is an awesome track, Collins said. I really am looking forward to racing the best cars in the Country and I really want to make the show, he added. Collins really came into prominence at the South Australian Title where he took it right up to Ryan Alexander and Dave Gartner, eventually finishing third. The season so far has been great, it is my first season in the class, we picked up a win at Avalon earlier in the year and finished third in the South Australian Title and then more recently, fifth in the Victorian Title. Also had a few other podium finishes across the season. I am really enjoying learning the new car after racing AMCAs for seven years, it is a lot different to drive and we are slowly getting our head around it, he added. My ambitions honestly is to make the show, from then on we will have a crack and move forward as much as we can, Collins said.